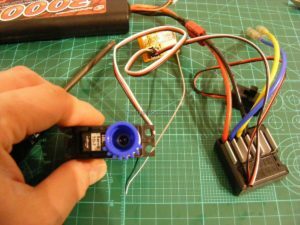 This entry was posted in Media, Reviews on January 5, 2018 by admin. This entry was posted in Future Releases, Media, Reviews on December 12, 2017 by admin. This entry was posted in Media, Reviews on November 9, 2017 by admin. 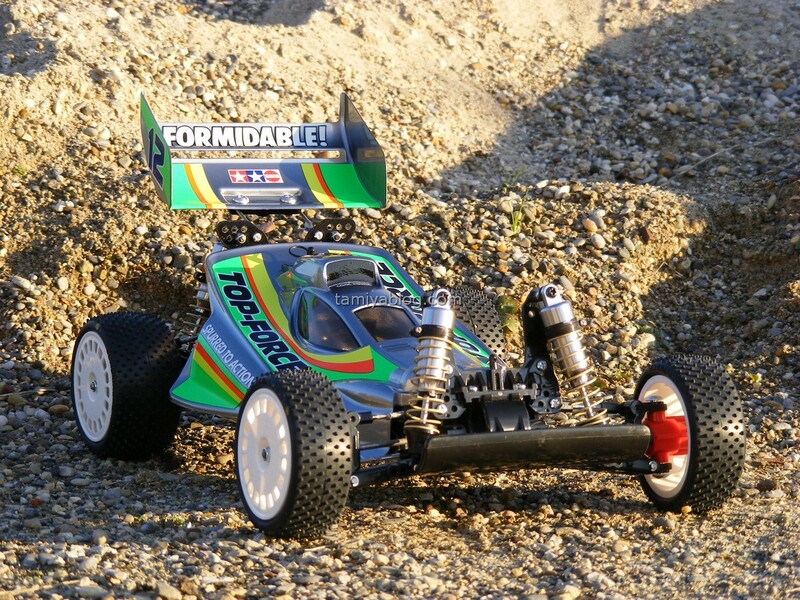 From time to time we´re presenting some builds, mostly of Tamiya’s great range of re-releases. 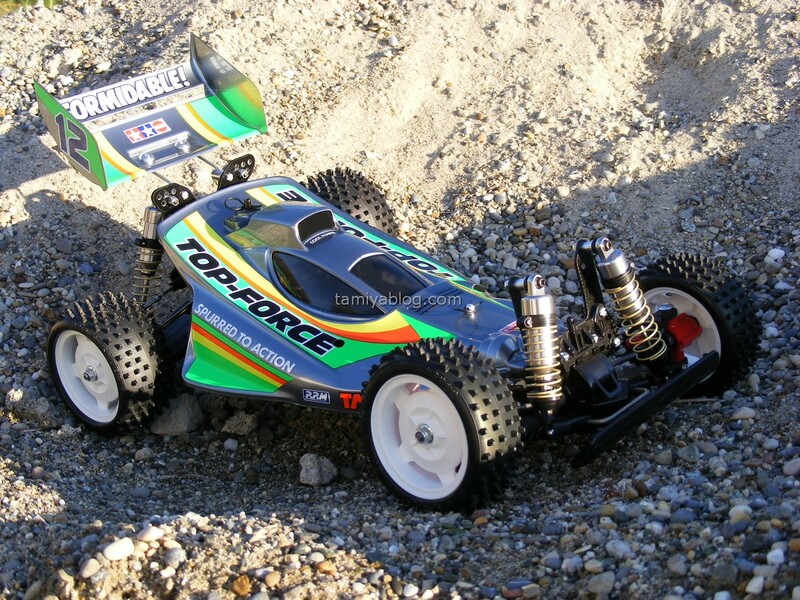 Today, we will show you the Top Force buggy which is Tamiya’s 100th RC Kit (1991) and was first re-released in 2006. 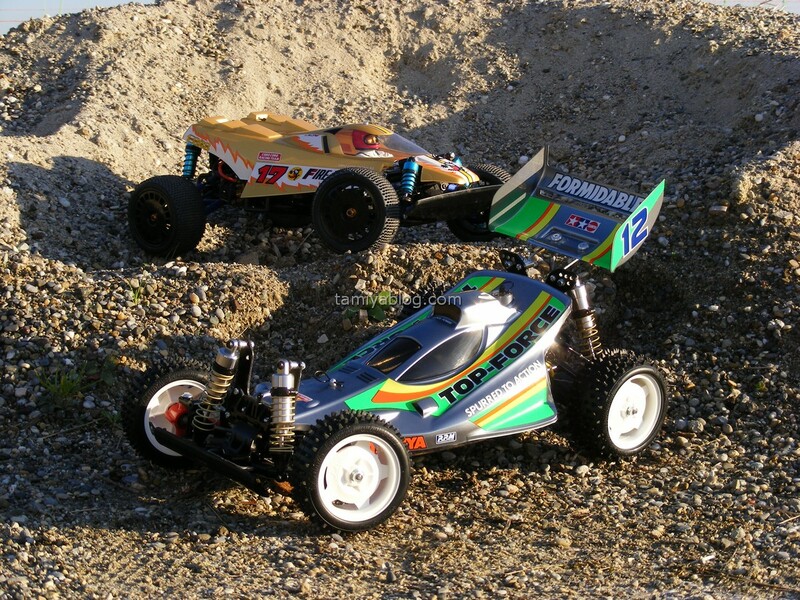 Now Tamiya did it again. The Top Force (2017) is back to show his potential. 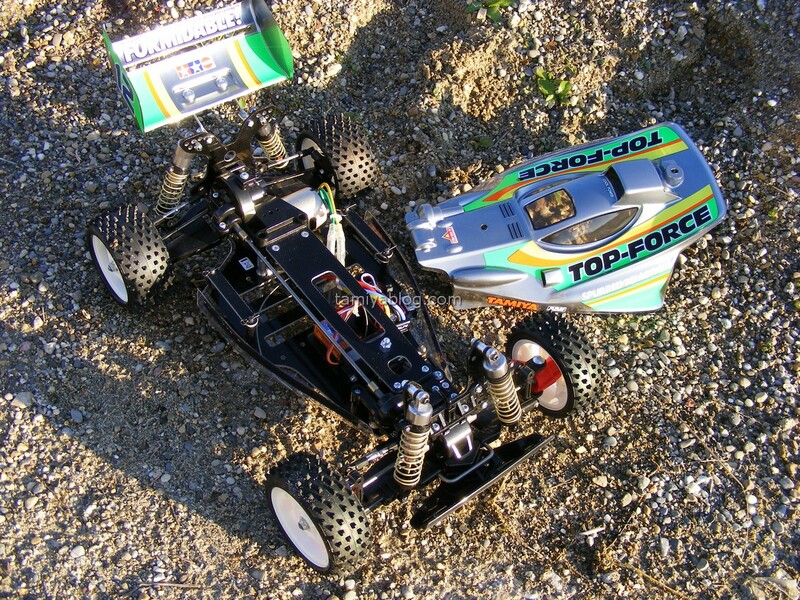 The so called “Vintage Racing” scene becomes more and more popular. 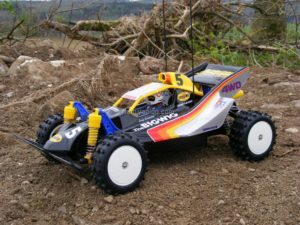 And it’s good to see other manufacturers following Tamiya re-releasing their classic cars from back in the 80´s and 90´s. 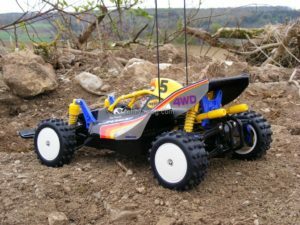 The Top Force, and especially the later released Top Force Evolution was Tamiya´s answer for the very popular off road racing scene in the early 90’s. 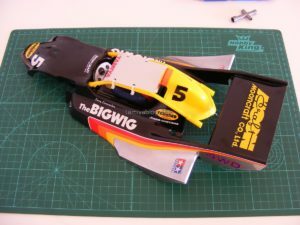 It’s based on the classic Manta Ray chassis (which itself is based on the TA01/TA02 touring cars), but comes with a double deck FRP chassis and damper stays, ball diffs, steel prop shaft, Lexan undercowl and universal shafts for the front end. 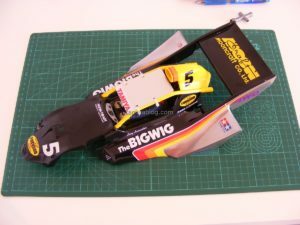 The body looks like a big wing, which gives the Top Force a very aerodynamic and aggressive look. But that’s history. 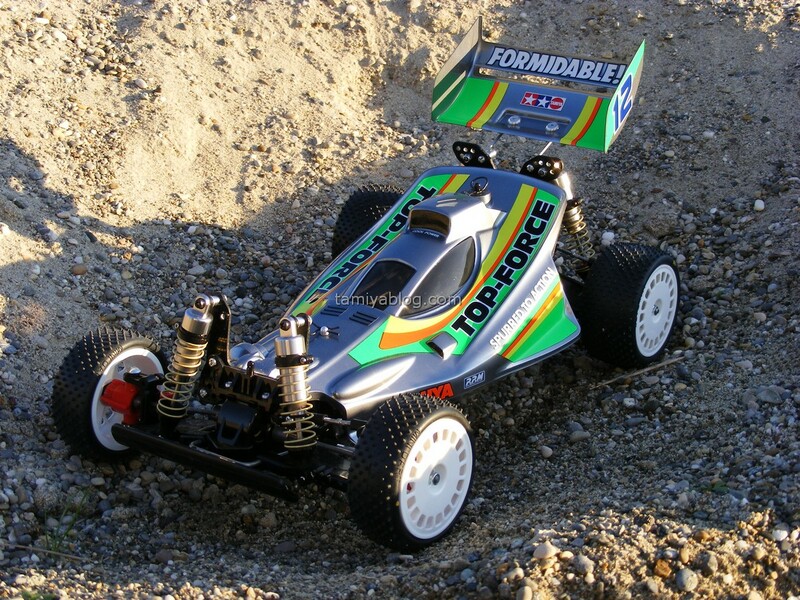 How good is the new/old Top Force ? 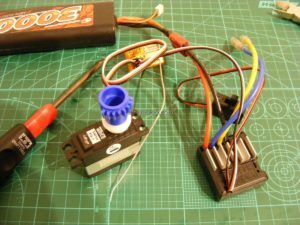 Building the kit was a joy. 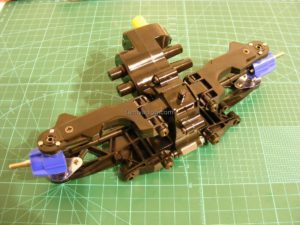 We built the kit with a full set of ball bearings, a classic Tamiya aluminum motor mount (the original plastic one was always a weak spot) and the “Tamiya Top Force 2017 High Capacity Damper Set” No. 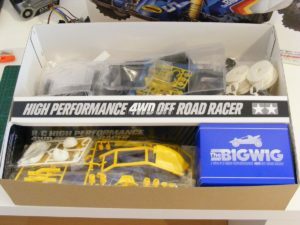 47358 (which is especially released for the Top Force 2017 kit). 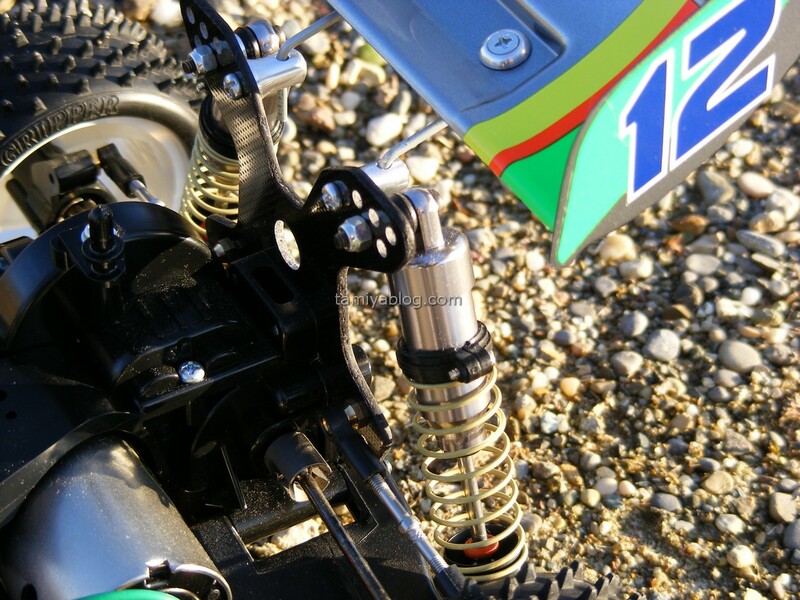 These dampers are of very good quality. 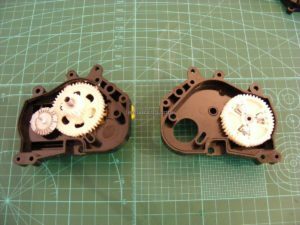 They work extremely smooth, and look excellent too. 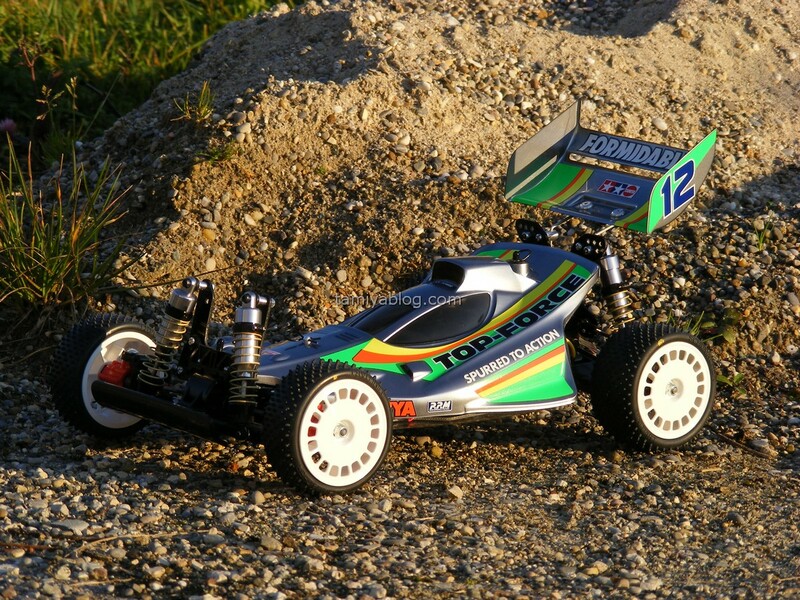 On some of the photos, you see the car with Tamiya DF-03 wheels and modern racing tires. A perfect set up for the vintage racing scene. As a regular reader, you may know that we lik alternate paintschemes. The Top Force is no exception here. 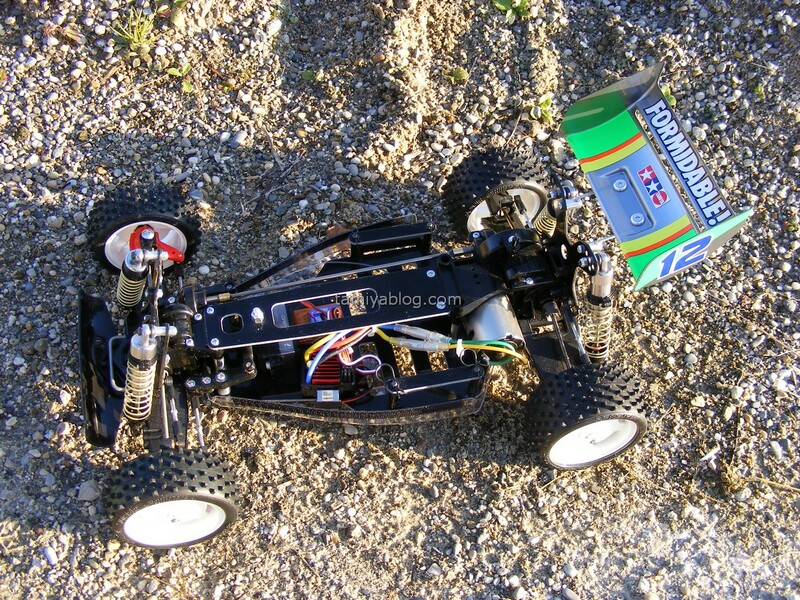 This time, our choice felt for the relatively new Tamiya PS-63 Bright Gun Metal. 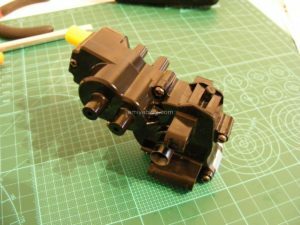 We like it a lot, and it suits the colour of the Tamiya High Cap dampers very well. Join vintage racing ! May the force be with you. 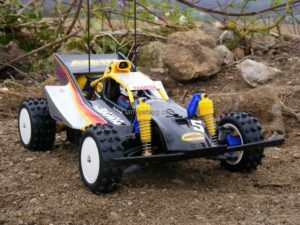 This entry was posted in Customized Builds, Reviews, Vintage on October 20, 2017 by dunebuggy. This entry was posted in Media, Reviews on September 1, 2017 by admin. This entry was posted in Media, Reviews on July 2, 2017 by admin. 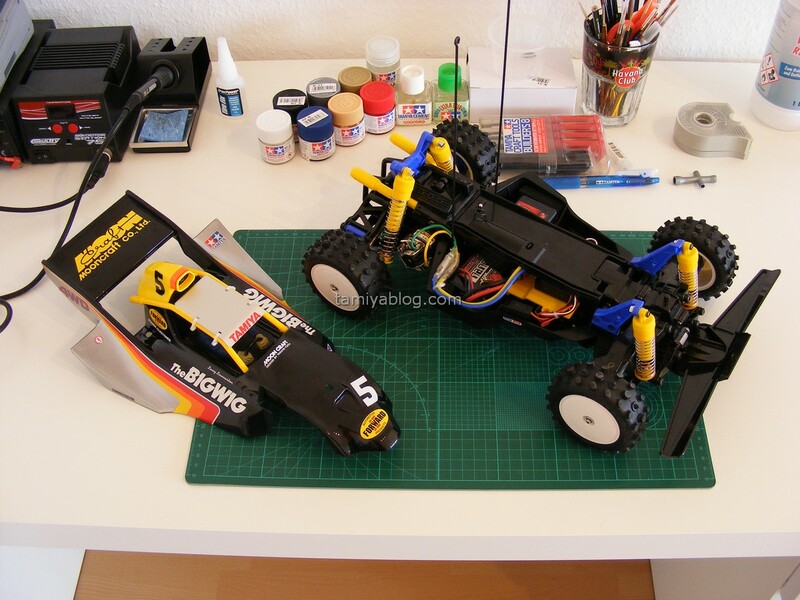 It´s 1986, the worldwide RC-Car Boom is near on the top. 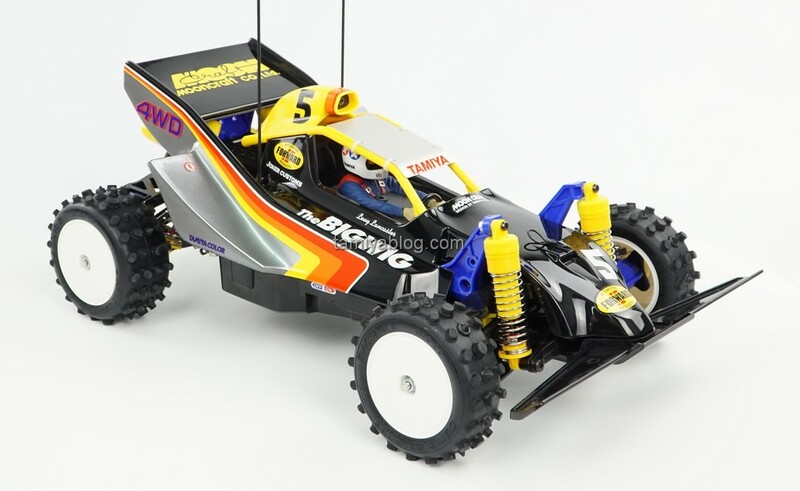 To commemorate 10 years of Tamiya R/C Models, Tamiya releases a very special offroad buggy, the Bigwig. 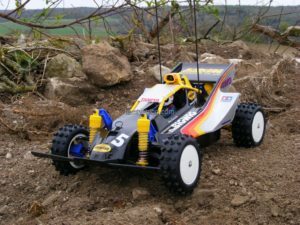 Not a normal car for it´s time. 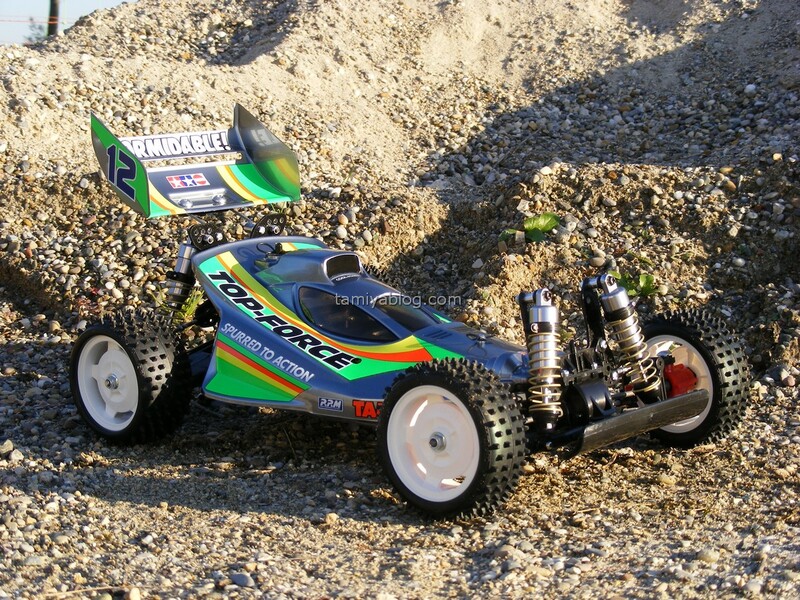 One the technical side, it wasn´t a very revolutionary buggy, like the later released Avante. 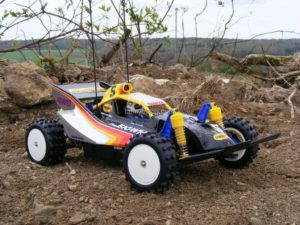 The car was based on the common Hotshot, Boomerang like drivetrain, but was equipped with the legendary Tamiya Mabuchi RX-540VZ Technigold Motor, well known from the Tamiya Porsche 959 Paris Dakar, which was powered by a special 8,4V Gold Power Pack. 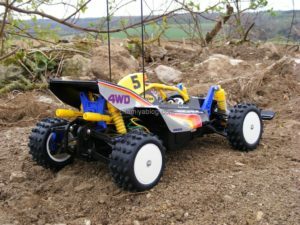 Anyway the Bigwig is a very special buggy in Tamiya´s R/C Car history. Because of it´s unique “one big wing” design by famed japanese designer Mr. Takuya Yura, president of the Mooncraft Company, well known for his racing car designs. 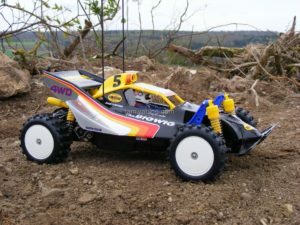 The very unique “Wing” look of the Bigwig is based on special high powered buggies which were custom made for the legendary “Pikes Peak” race in America. 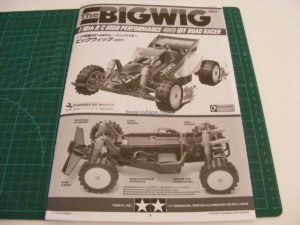 After 30 years, the Bigwig is back again. 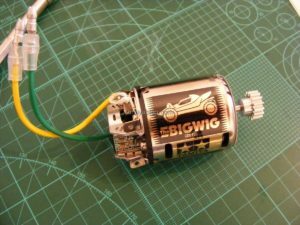 What are the differences on the new Bigwig 2017 ? Not very much. 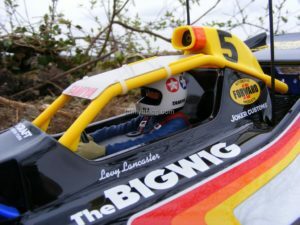 The stickers were changed a little bit, as on most of the Tamiya classic re-release cars. Which can also be an advantage. 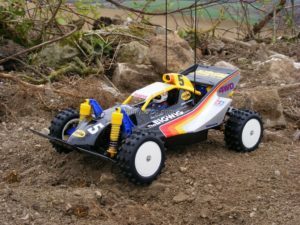 The “Mooncraft” Logo on the rear wing of the Bigwig 2017 looks way better than the one on the original release in our opinion.The “new” model comes with full ball bearings, the original 80´s kit wasn´t completely ballraced. 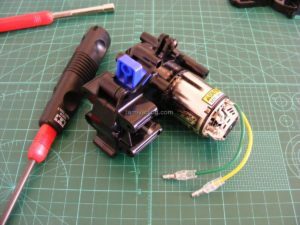 The RX-540VZ Technigold motor was changed for a special labeled Tamiya GT-Tuned Motor (like it was used for the Avante and Super Hotshot re-releases too). That´s it. 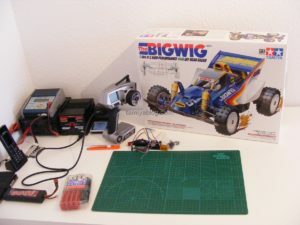 Let´s build the new Bigwig ! Inside the new kit. No blisters as known from the classic kit. 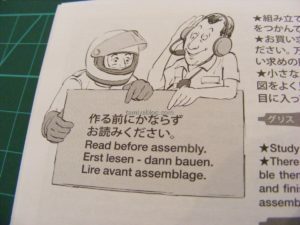 Some may laugh, but that´s very important. 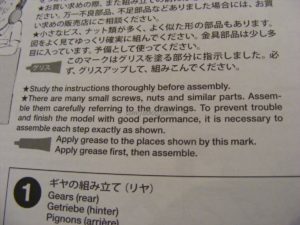 And a good advice, also for experienced modelers. 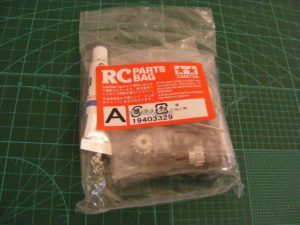 Let´s start with parts bag A. 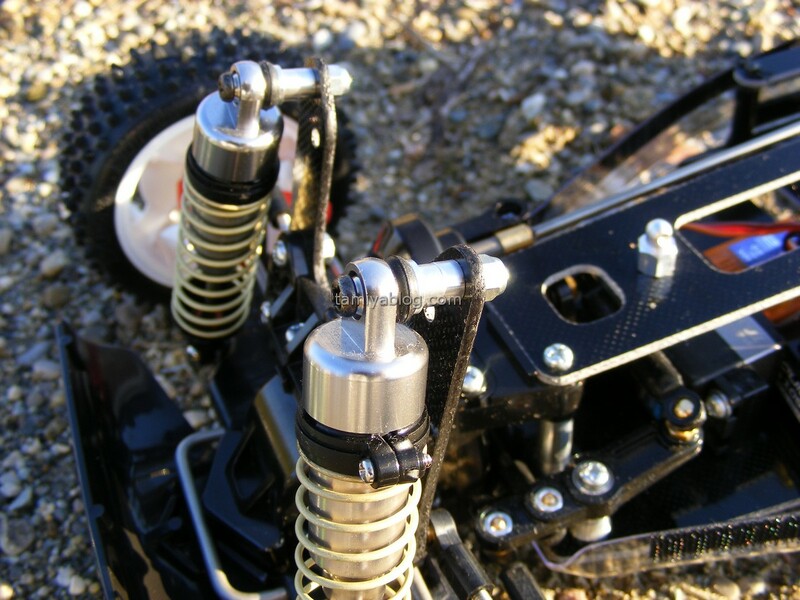 Special rack and pinion steering set up. Electronics, waiting to be installed. 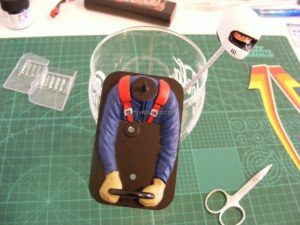 The beautiful driver figure, worth doing a good paintjob on this one. 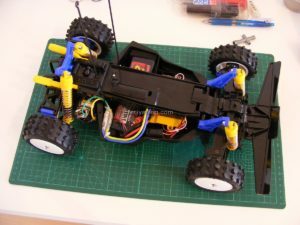 Car and body completed ! It was a pleasure working one the Bigwig 2017. 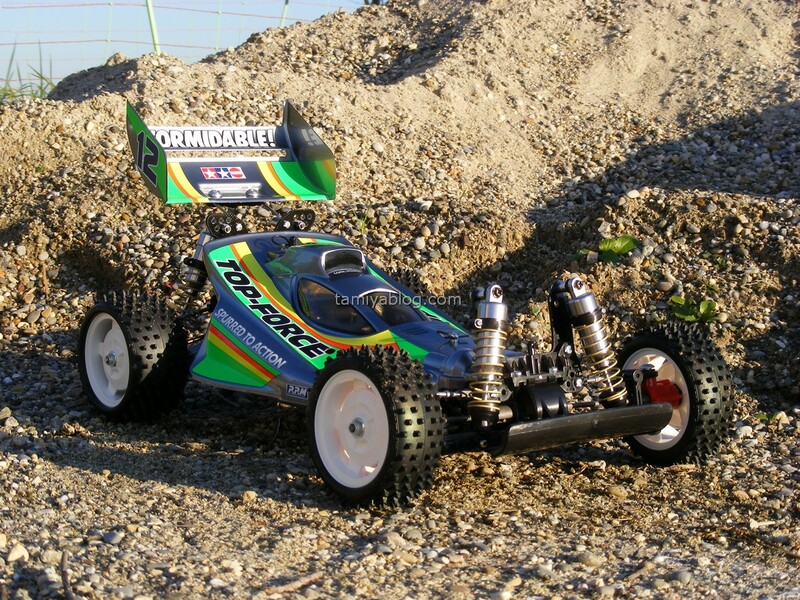 It´s such a cool thing to build a classic Tamiya buggy. 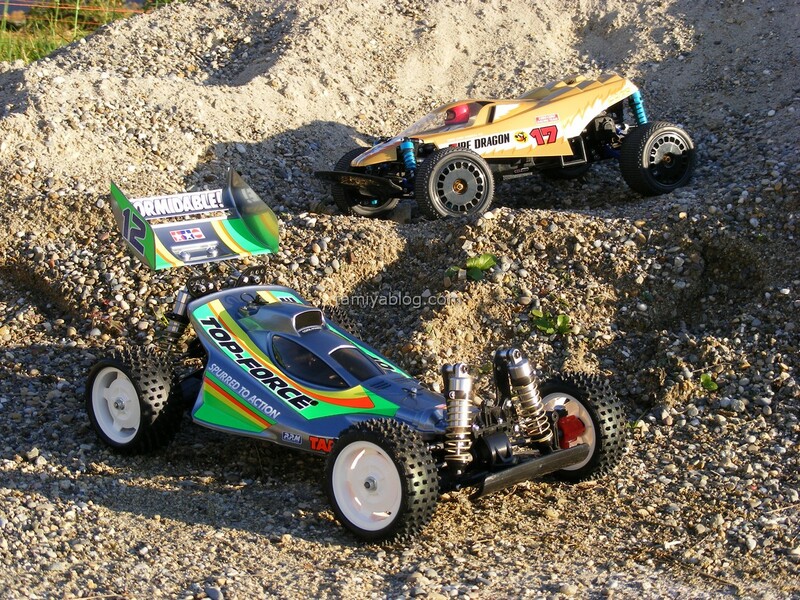 For most of the Tamiya re-releases we really like to do alternative paint-schemes on these cars. A real challenge in case of the Bigwig. Because most of the cars were built in boxart scheme. In the past and also today. The boxart scheme is great and really iconic. 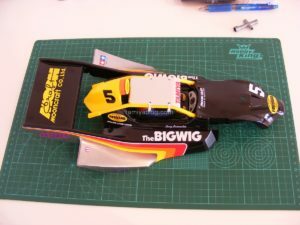 And it´s not really easy to find colours which suits the red, orange, yellow Bigwig stripes well. But we tried it. And we are very happy with the result. Enjoy ! 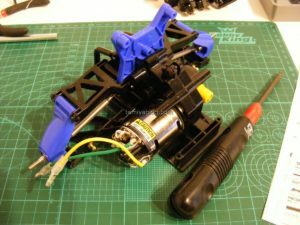 This entry was posted in Customized Builds, Reviews on April 16, 2017 by dunebuggy.